Give your floors a fabulous makeover. A new coat of paint on your walls may boost the ambiance of your rooms, but new tile floors dramatically change everything. Make an impression on your guests and your family by shopping for stylish tile flooring. Easy to maintain and ideal for any room in the home, tile floors are excellent flooring options for those who want a practical and stylish floor. 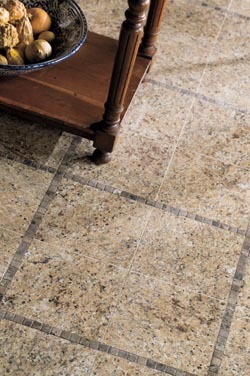 Durable, stylish, and impressive, porcelain tile is an excellent choice for many homeowners. It is strong and exceptionally stunning, offering many decorative purposes for any room. At our store, we carry much more than you would find in a typical home improvement store. Allow one of our sales specialists to show you various products that come in all varieties ranging from dark and light shades to tile with unique patterns. Available in all sizes and patterns to complement your home décor, you’re sure to find that right product at our showroom. Go to a standard flooring warehouse, and you will find tile floors. However, they may not have the exact match for you. In addition, these types of businesses often do not provide installation of their products. When you shop at our flooring showroom, we not only stock all varieties of tile floor products, but we also perform tile flooring installation. From design assistance and product selection to installation, we help you every step of the way. We also offer special guarantees on all of our products and services. Our Ultimate Confidence guarantee means that you can shop with confidence. If you purchase a 4-Star or 5-Stare floor, and you are unsatisfied with your floor after 30 days, we’ll replace and pay for the labor. With our lifetime installation guarantee, we promise to repair your floor for free if you ever have installation-related issues in the future. We stand by our products and services, and we have complete confidence in our work. Contact us to discuss your flooring needs with one of our friendly and knowledgeable team members. We proudly serve customers throughout St. Paul, Bonnyville, Fork Lake, Lafond, and Elk Point, Alberta.